With both Marvel and DC having their own formats for re-releasing old content, it wouldn’t hurt to compare the two. After all, DC and Marvel have generally had a rivalry since the 1960s, friendly or otherwise. Luckily, the real winner in the end is the comic fandom… but what are the strengths and weaknesses of the two formats chosen? Marvel came first, with bi monthly digests published by Archie Comics. 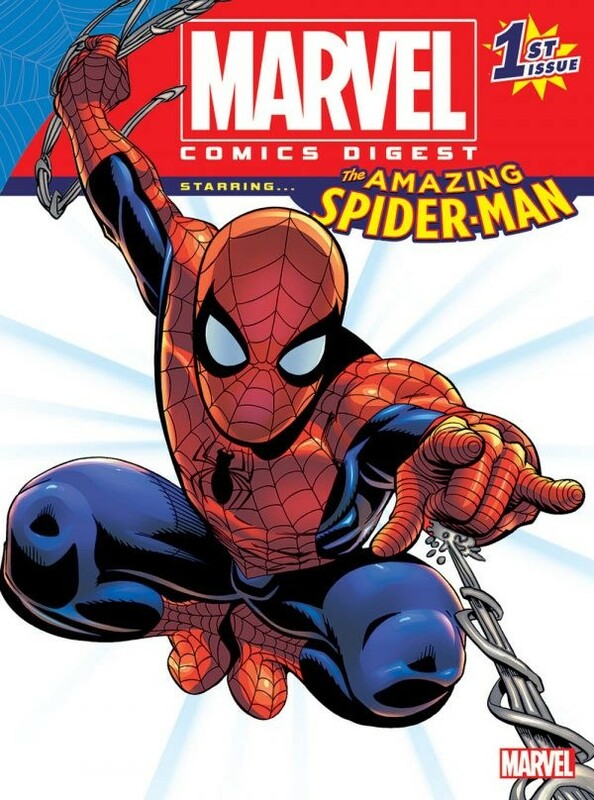 Running with a newsstand price of $6.99 and a page count nearing 300, the anthology series Marvel Comics Digest doesn’t focus on storylines or specific characters. Instead, Archie has chosen to go for the easiest path, marketing-wise. Each comic focuses on what’s hot in the movie theaters that month, or on a character or team that’s well known. The first issue, published in July 2017, had Spider-Man as the focus character, coinciding with the release of the movie Spider-Man: Homecoming. Thor was the feature character the month Thor: Ragnarok came out, Black Panther took over when his movie made box office records, and Thanos was featured when Avengers: Infinity War shocked the world. The current issue, as of this writing, features anyone who’s gone by Ant-Man or Wasp to tie-in with their movie. It’s easy to see how well this could work, and the publishing tie with Archie Comics actually has a good angle for Marvel. Archie Comics are pretty much the only remaining comic company that has anything released in supermarkets or on the newstand, with Bongo Comics being the only other one regularly seen. This means that the issues, while released only once every other month, will have some fantastic visibility at the checkout line and can easily sell a lot of copies this way. It also helps that Archie Comics has some editors who really know what content to choose. So far, every book released under the Marvel Comics Digest line has featured some of the best stories of the Silver and Bronze age of comics for the front two thirds of the book. Legends like Steve Ditko graced the pages of the first issue, using his last tale: Just a Guy named Joe from Amazing Spider-Man #38. Giant-Size X-Men #1 was included with the X-Men, showing off the all-new, all-different X-Men of the Bronze age. For some reason, the Black Panther volume has the third and fourth issues of the first volume The Avengers, featuring the re-introduction of Captain America. Not every decision makes perfect sense, but the issues themselves are still good. The back chunk of the comic is almost always filled with reprints from Marvel’s more recent kid-friendly fare. Marvel Adventures is a mainstay, with the recent Marvel Universe TV-based line almost always getting an issue or two in. While you certainly won’t catch up on the main Marvel universe’s continuity, it is fantastic to see a book be truly family-friendly these days. Admittedly, this is because they hand-pick reprints that are family-friendly, and craft the book around that, but it works really well. The main downside of the Marvel Comics Digest is the format chosen. Digest books look snazzy on the newsstand, but are remarkably difficult to read sometimes. Splash pages by the Gods of comics like Jack Kirby and Steve Ditko can become muddied and hard to see, despite some really great digital cleanups on the older comics. The bimonthly anthology style may also hurt sales, as a lack of ongoing stories makes the Marvel Universe feel fragmented in some aspects. An ongoing monthly Digest featuring Roy Thomas’ or Steve Engelhart’s Avengers could really make for a great ongoing publication, as would one featuring just Spider-Man from the beginning. For the angle Marvel and Archie have taken, it works… but it ultimately feels like they’re taking a path of least effort. DC, meanwhile, has just released their own entry into the foray of mass-market reprints. The publication is once a month, with two volumes of character-titled 100-Page Comic Giant! coming out every two weeks at your local Walmart. With a price point of $4.99 per issue, it becomes easy to see that DC is aiming for the budget-conscious comic fan. Using franchises like Superman, Teen Titans, Batman, and Justice League also means that DC knows what names are big in their stable, and diversified the selection in each comic by pushing “lesser names” in their collection as well. The draw to each volume, aside from the price point, is that major talent currently working at DC have all elected to make original content for each issue. Running under fifteen pages an issue, we have specials like Jimmy Palmiotti taking on Superman or Brian Michael Bendis writing for Batman. So far, these stories have been great, worth reading into and trying to find each comic in their specially-made Walmart bin. Time will tell if future chapters in these tales will hold up, but the creators involved make it difficult to believe that those stories could completely derail. To fill in pages without breaking the bank, DC has decided to select key comics for reprinting on a monthly slate. Loeb’s 2003 Superman/Batman will be the monthly Superman comic included, but Superman’s 100-Page Giant will also include Johns’ 2005 Green Lantern and The Terrifics filling in pages. Teen Titans went a little more closer to theme, featuring Johns’ 2006 Teen Titans run alongside the fantastic recent Super-Sons and Sideways books. While I did not pick up Justice League or Batman, the choices there are also thematically appropriate: the Bat-Family fills in Batman’s pages, while heroes best known for being in the Justice League like Flash and Aquaman fill in the title content. DC has also chosen a magazine format, similar in scale to a single published issue. This means that the comics art is preserved excellently, with the only difference in printing being just in paper quality rather than scale. The covers are also honest about the content used, featuring a headline running at the top advertising the main characters, and a table of contents with a brief description of the comic ahead. This does put it above Marvel, who has neither of these beyond the cover advertising the focal character, and leaves the books feeling more coherent than their competition. Indeed, the only real weakness on DC’s end is the possible lack of family friendliness, despite the covers appearing much like the many kid magazines on the stand now. While the creators and books chosen are nothing short of incredible, there are some thematic concerns when a hopeful character like Superman is put alongside a pessimistic book like The Terrifics. It also should be said that the comics weren’t put in for their family-friendliness either, with Green Lantern #1 including people being blown into what can only be described as chunky salsa. Parents should be on the lookout, especially since a fourth of the content chosen comes from DC’s “New 52” era in 2011. Also, Batman: Hush was chosen, which may be a great Batman story, but doesn’t feel like the best choice for this. DC could also stand to reach into their 80+ years of content as well. While realizing that Superman/Batman premiered 15 years ago is enough to make someone feel old, DC could have gone for Grant Morrison’s time on Justice League, the hilarious-in-retrospect Bob Heney run on the Teen Titans, or even Neil Adams’ time on Batman. This is a perfect opportunity to have new fans realize how awesome their back-catalogue is, rather than just push new books. Admittedly, it totally works from a marketing perspective, just like how Marvel’s works for them. Like it was said above, the real winner here are the readers who pick these volumes up. While DC has some serious strengths in being a monthly publication with an ongoing series of storylines, Marvel’s strengths come from having more content that is certainly family-friendly and stretches almost the entire run of their publication history. Both can stand to learn from the other, but are in excellent locations at the moment. Time will tell if these publications continue, but it’s easy to see that both Marvel and DC have their fanbases in mind with these comics.